19 April 2018 – RCT has helped the world’s largest underground copper mine, El Teniente, successfully and safely mine in mud, in what is believed to be a world-first mining method in these conditions. This impressive feat was facilitated by the company’s specialised department, RCT Custom. The bespoke team helped deliver a state-of-the-art ControlMaster® Automation solution allowing the copper-rich mud to be accessed with minimum risk. The Codelco-owned site is prone to mud rush caused by ice melting on the Andes range situated on the surface, a hazard that closed the exploration area for months on end. This combined with the company’s plan to expand operations to the seventh and eighth levels made it crucial to find a solution that would allow them to mine mud ore safely. Codelco issued RCT with the challenge of retrofitting RCT’s ControlMaster® Teleremote and Guidance Automation systems previously installed on a surface dozer, loader and truck at its Andina mine. RCT had to upgrade this equipment for fitment onto the site’s Sandvik LH517 loaders operating in the El Teniente underground mine. Operators were relocated to a surface control room connected to the loaders over the mine’s communication network. “It was quite a challenging engineering project which required the combination of proven RCT solutions with a mine's network – but RCT thrive in these situations,” said RCT’s Senior BDM. Phil Goode. While the existing solutions would suit all mine conditions and achieve the outcome desired by the client as is, a factory refurbishment and upgrades were essential to ensure the retrofit went to plan. Installation and commissioning were undertaken by RCT with its channel partner, Power Train Technologies (PTT). This required the system to integrate into Codelco’s existing Digital WiFi Network, which required the collaboration between the client’s mining, maintenance, engineering and innovation teams. “The integration of refurbished equipment, installed on working production loaders into the existing mine network posed unique challenges, all of which were overcome by professional collaboration between, Codelco, RCT, and PTT,” said Mr Goode. 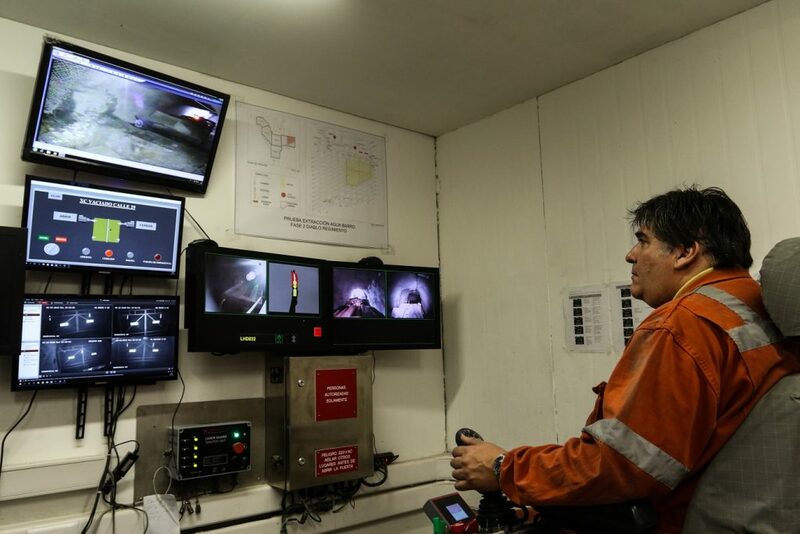 El Teniente’s Chief Automation Mine, Rafael Guzmán, explained that the system utilises the standard wireless network, configured and managed with its own resources, which is used in various systems of underground work. “The important thing for the site was to have a robust and reliable communications system, which in our case translates into one of the largest networks of this type in mining,” added the Department Corporate of Automation’s Senior Engineer, Norma Vargas. The operators’ working environment vastly improves, as the operators were removed from the cab of the machine and relocated into an Automation Centre on the surface of the mine. This customised solution was located in an office on site, complete with amenities. In addition, the Guidance Automation technology removes disparity between drivers and the time it takes to complete the checklist during shift change has also decreased which further increases productivity. Guidance Automation technology will prevent damage to the loaders while allowing them to be driven in third gear – which results in more buckets each shift. “Productivity and safety can go hand-in-hand. We have a precious treasure waiting to be extracted from the muddy water, and we are now on the right path thanks to RCT’s Automation,” said El Teniente Mine’s Innovation and Development Project Manager, Pablo Gándara. “Our goal was to use technology to reach this somewhat hazardous reserve, which has a potential of about 2 million tons, with purity of 0.9 that is very important,” said El Teniente Mine’s Innovation Project Manager, Nicolás Montecino. As well as delivering the technology, operators underwent RCT product training on the new solution to ensure they got the most out of the technology. “It was great to have spent time with the El Teniente mine operators to deliver hands-on training and guidance to help them take ownership of the new technology,” said Mr Goode. El Teniente’s Innovation Engineer, Nicolás Montecino, said he was not only amazed with the system but he was impressed with RCT Custom’s level of professionalism. “The mine will be able to recover reserves that were once abandoned after being deemed too dangerous to access by our operators who would be exposed to mud water pumping through the area,” said Head of Diablo Regimiento, Leonardo Barría. “This was a significant, innovative engineering project for RCT, and we are proud to have been part of it,” said Mr Goode. RCT's automation solutions in action at El Teniente. Photo: Revista El Teniente.